The name of this trail really is Five Miles of Hell, and it lives up to it's name. This is an extreme single track trail made by dirt bikes, for dirt bikes. It travels mostly over slickrock but frequently drops into deep sand washes that must be climbed out of again and again. Before doing this trail, make sure you are ready for a challenge. It's a good idea to do this trail with a group, however a small group is best since there are a few sections that tend to require a group effort to push bikes through obstacles that can't be ridden cleanly, too many and time will quickly start to burn. Solo rides have been done and done very quickly, some under 2 hours, but it's a risk if something goes wrong. We had a group of 3 and we completed the entire loop in 6 hours. We weren't rushed, but kept a good pace with a few good breaks. This trail is a lot of work, so take plenty of water. The "Hell" Section is designated on the map(below) by the flame icons and is actually around 7 miles. The rest of the trail is easy rolling whoops and hills. We traveled the loop in a counter clockwise direction, although it can be traveled either way. Some argue as to which way is harder/easier. There are camping areas after you exit I-70 along the dirt roads and there is a staging area at the trail head. 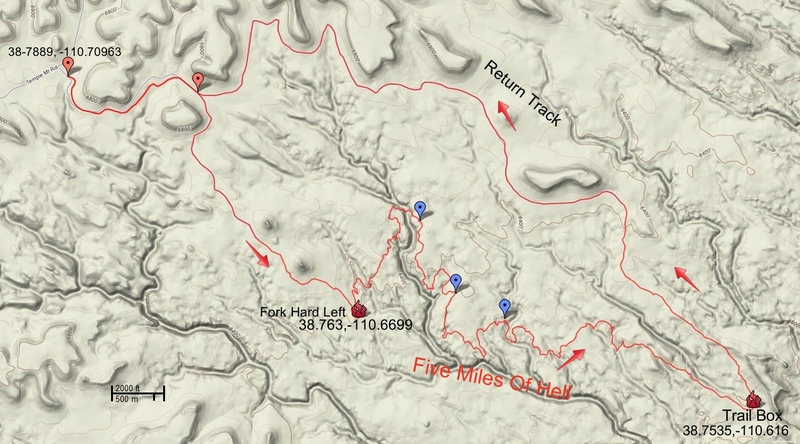 There are 3 "bail outs" along the trail as designated by the blue markers on the map and key GPS points below. These routes will take you back quicker to the return route although we did not take these. 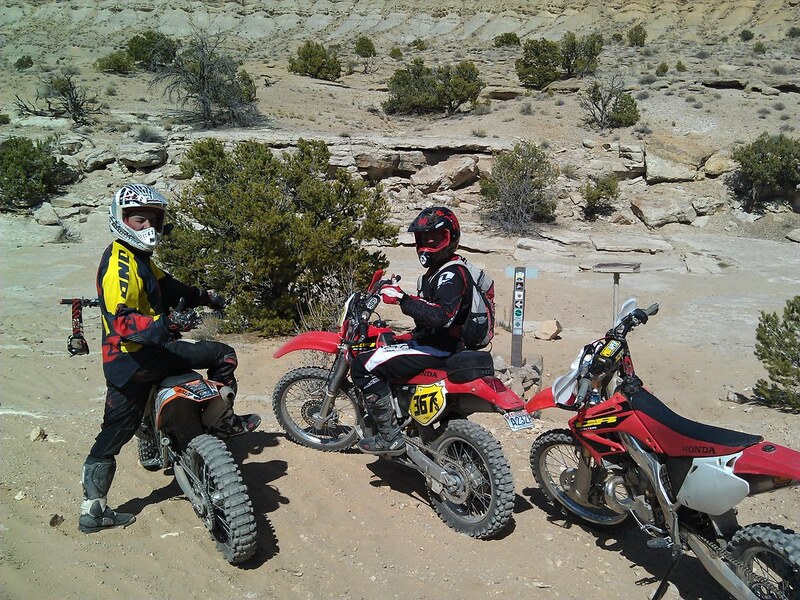 Location: San Rafael Swell, near I-70 (see map). 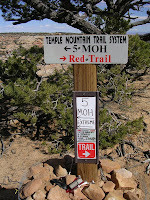 Click for Directions to the Trail Head from your location, see the map below for trail route. Getting ready to hit the trail! The day we ran the trail the temps reached 80 at the most. It felt much hotter. After the trail head you follow white painted lines on the slickrock. The trail is pretty well marked and easy to follow. Pay attention though, if you get off track you'll have to backtrack to find where the lines pick up as we did once. I'd hate to try to travel this trail without the lines, they keep you moving instead of searching for the correct route. Success! This is the end of the hard stuff. We were so ready to see this spot! Excellent write up and video. 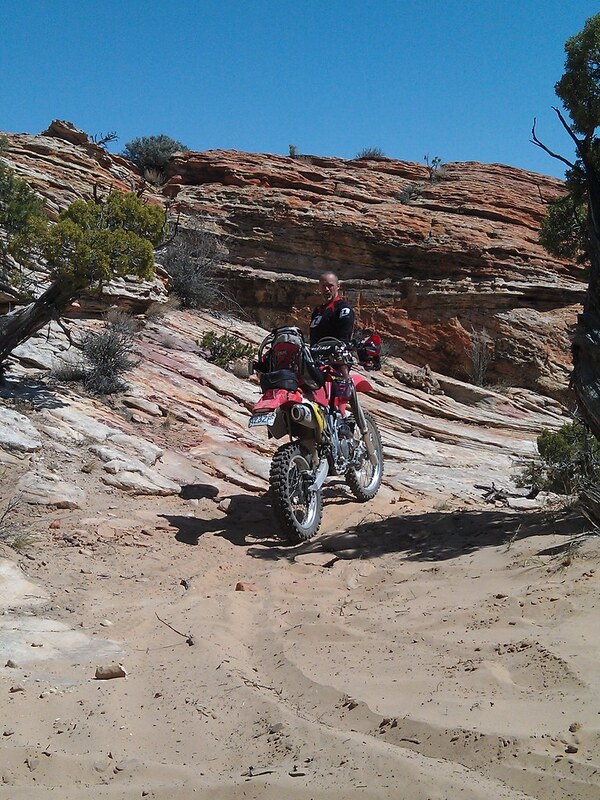 Have to admit,since a few weeks have passed since riding the trail, I'm starting to think I would do it again. Only change would be for cooler temps. Figure 55-65 degrees would be ideal otherwise you cook like we did. Thanks! it was a little warm. It's crazy how 70 to 80 felt so warm on that trail. There's always something about a challenge that will keep calling you back I think! It was fun doing the trail with you guys! This page has been referenced repeatedly in our preparations to ride the 5MOH trail. Thanks for the video and write up. We are coming from Los Angeles to ride this beast! Glad it was helpful. It's a beast for sure. Have fun! For my 40th birthday I rode this trail solo, out n back, twice In under 4 hours. I had ridden it several times before so that certainly helped with line choice and saving energy. I'd love to see what a real pro could do on this trail. It's an acquired taste. Not really over the top techy but just a constant beating. I doubt I could pull that off again. 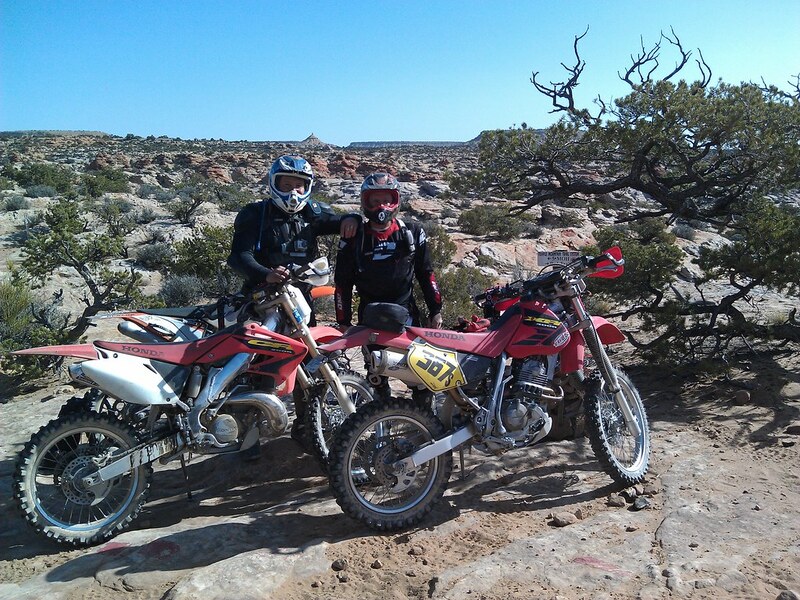 It was one of my best days ever on a dirtbike.